A common temptation for religious people is to fall into a form of a legalistic self-righteousness. It is appealing to assume that what God requires may be boiled down to a simple code of behavior such that those who obey it earn a reward, while those who do not merit condemnation. People who are not religious may certainly have their own forms of legalistic self-righteousness, but our immediate concern is to address our own temptations. For the prideful attitude that we have somehow fulfilled all that God requires of us is simply deadly for the Christian life. 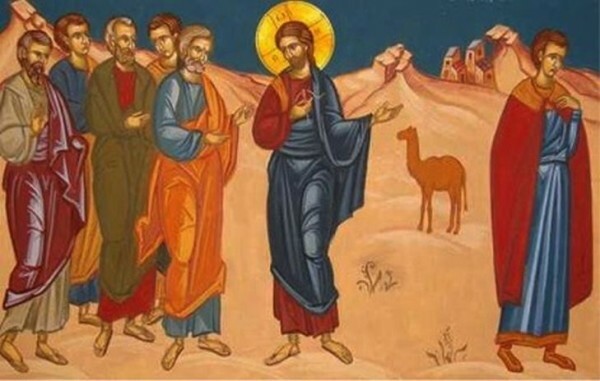 The Jews of first-century Palestine typically viewed people like the rich young man in today’s gospel reading as those who were very pleasing to God. Not only does the man claim that he has obeyed the Old Testament commandments, but his wealth was understood to be God’s blessing upon him as a righteous person. That is why the disciples were astonished when Christ said that it was very hard for a rich man to enter the Kingdom of Heaven. Perhaps this man was like a Christian today who lives according to the teachings of his church and is successful in his business and family life. He was a model citizen of his community and surely knew that. The distance between conventional religious and cultural success and finding eternal life remains great, nonetheless. Perhaps that is why the rich young man asked the Lord what he needed to do in order to gain eternal life. He must have sensed that something was missing or that there was more required to enter into the Kingdom. That is when the Savior gave him a challenge well outside of the man’s comfort zone: “If you would be perfect, go, sell what you possess and give to the poor, and you will have treasure in heaven; and come, follow me.” Since he loved his possessions, he went away sorrowful. For the Lord gave him a requirement that exposed his deep love for material things and the status and comfort that they provide. The contrast between this rich man and St. Paul is stark. As he wrote in today’s epistle passage, St. Paul knew that he was “unfit to be called an Apostle, because I persecuted the church of God.” Elsewhere he refers to himself as the chief of sinners upon whom God had mercy as an example of His overwhelming grace. (1 Tim. 1:15-16) Before his conversion, Paul had been “faultless” in obeying the Old Testament law and a zealous Pharisee. (Philippians 3:6) He had come to recognize, however, that the confidence he had had in his own religious achievements was simply garbage to be left behind when he embraced the true righteousness of God through faith in Christ. As someone who had previously persecuted Christians, St. Paul simply acknowledges that “by the grace of God I am what I am, and His grace toward me was not in vain.” He did not go away sorrowfully when the Lord appeared to him in blinding light on the road to Damascus with the words, “Saul, Saul, why are you persecuting me?” (Acts 9:4) He obeyed and said, “Lord, what do you want me to do?” before being baptized and beginning his very unlikely ministry at the constant risk of his life. Instead of trying to build on whatever righteousness he had achieved by obeying the Old Testament commandments, he threw himself entirely on the mercy of the Lord, trusting that the One Who died and rose again for the salvation of the world was able to heal his soul in ways that he had never been able to do through his own conventional religious observance. St. Paul died as a martyr and his ministry involved deep struggles of so many kinds, including imprisonment, beatings, narrow escapes from death, and arguments with those who sought to corrupt and weaken the churches he had established. 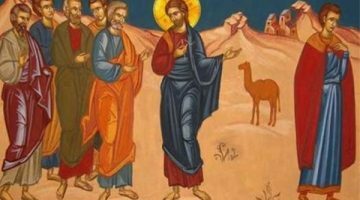 Who would not look at this former Pharisee who became the great apostle to the Gentiles and say, “With men this is impossible, but with God all things are possible”? His unique and exalted ministry which has so profoundly shaped the Church to this day was not simply the achievement of a gifted religious personality. It was the gracious blessing of God at work through a person who had no illusions about his own brokenness and weakness, who had learned not to trust in his own ability to earn anything from God. His humility made it possible for God to work in him what Paul could never have accomplished on his own. The Savior’s exacting statement to the rich young man was an invitation to acquire the same spiritual clarity about his life. By revealing to him the weaknesses of his soul, Christ opened his eyes just a bit to the inadequacy of viewing his relationship with God in terms of a list of legal requirements to be checked off. He needed much more than the legal advice of a rabbi who could clarify the expectations. His inability to demonstrate his love for God and neighbor by obeying Christ’s command showed that he needed healing that he could not give himself. He needed the God-Man Who conquers death through His glorious resurrection and makes us participants by grace in the life of the Holy Trinity. He fulfills our ancient vocation to become like God in holiness by healing our souls in ways that a set of legal or moral standards never could. Those who are so strongly tempted to trust in their worldly accomplishments and comforts, or in the admiration of others for their supposedly exemplary lives, often need a bold, shocking message or course of events to wake them up from their complacency. If we will open the eyes of our hearts just a bit to the light of Christ, however, we will see that none of us may claim to have mastered God’s requirements or to earn our way into the Kingdom based on our good deeds. Our calling is not simply to be religious or moral people, but truly to become brilliant with the divine glory. Before such a high calling, we must not go away sorrowful due to our inadequacy, but should instead fall on our faces and voice the Jesus Prayer from the depths of our hearts. We must obey as best we presently have the strength to do, using the awareness of our weakness to open ourselves more fully to our Lord’s grace through our humility. As we continue to celebrate the Dormition of the Most Holy Theotokos, we should look to her as the best example of a humble, obedient person united to Christ in love. She became the Living Temple of the Lord in a shockingly unconventional manner when she accepted the Savior into her life as His virgin mother. She did not go away in sorrow upon hearing the message of the Archangel, but said, “Behold the handmaiden of the Lord. Let it be to me according to your word.” She served Him the rest of her life, even standing by His Cross and going with the other women to anoint His body on the morning of Pascha. In her “falling asleep,” she shows us that such a life of loving obedience leads to the Kingdom of Heaven, not through legalism, but by humble, complete receptivity to the grace of her Son, in Whom all things are possible. Let us all follow her example for the healing of souls.